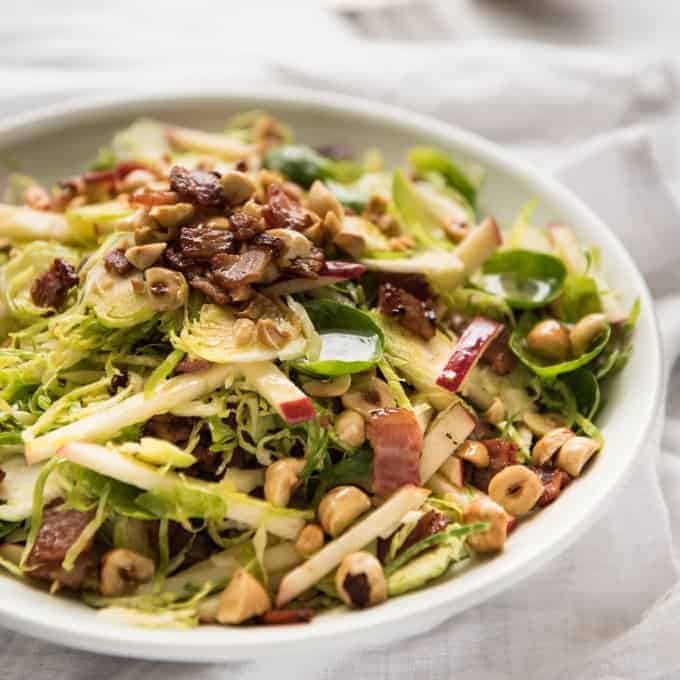 Brussels sprouts, bacon, apple and hazelnuts is a magic combination that makes this Brussel Sprout Salad that so good, you’ll be happy to have it as a meal! In fact, I’m sharing this recipe at the request of a brussels-sprout-hating friend after I served this at a lunch!! A couple of weeks ago, I invited my friends around for a Sunday Roast Lamb Lunch. Nothing better than a leisurely Sunday spent with friends and a table laden with food! I’m actually sharing my Roast Lamb recipes on Wednesday along with a peek into my real life with a video of my lunch! I can’t wait to share it with you!!! But I’m getting ahead of myself. 🙂 So one of the salads I made was this Brussels Sprout Salad. It’s a personal favourite of mine, but I still didn’t expect it to go down as well as it did. So much that when I asked my friend Rach which (if any) of the salads I made were worth sharing with my readers, she said this Brussels Sprouts Salad, hands down, even though she’s not a fan of Brussels Sprouts!!! 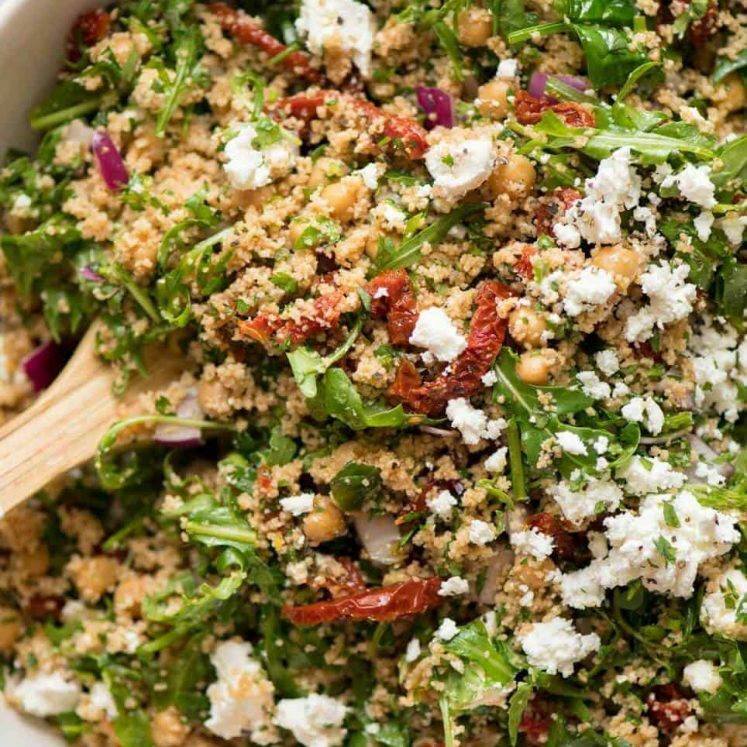 The reason this salad is so darn good is the ingredients in the salad itself. My friends and I always say that a great salad comes down to the dressing. But this is one of the rare exceptions. 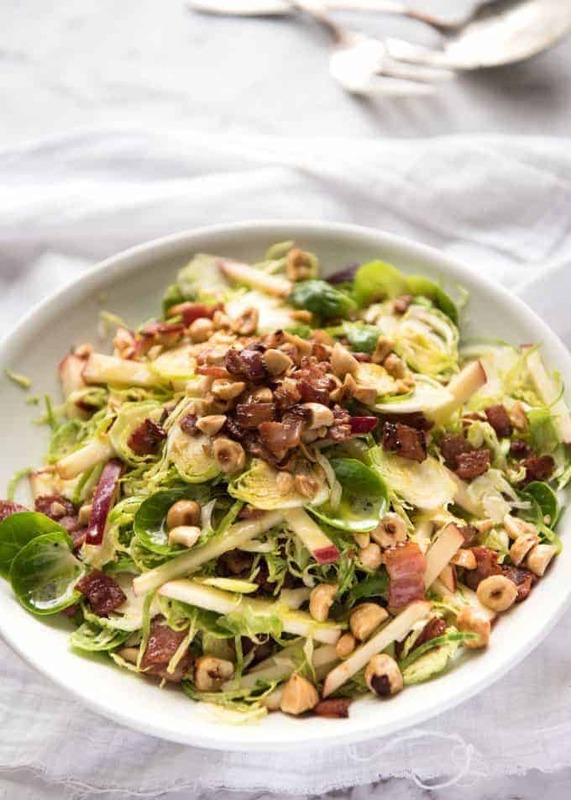 The combination of shaved brussels sprouts (which really tones down the flavour of brussels sprouts), the fresh sweet juicy apple, warm crunch from hazelnuts and the salty pops of bacon is a winning combination. It’s so good that I keep the dressing very simple – it just needs a light coat of moisture, it doesn’t need tons of flavour. 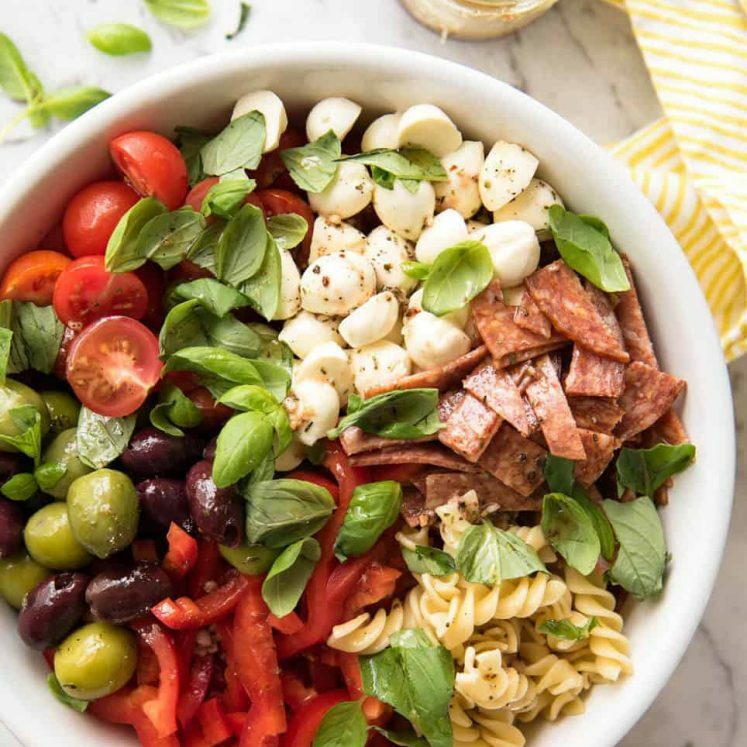 There are tons of flavours going on in this salad but they are balanced nicely so this is not a heavy salad. It is fresh yet has plenty of flavour. It’s light enough to serve on the side of heavier meals, but also perfect with white meats and seafood. Regular readers know that I’m all about food with flavours that packs a punch. When it comes to salads, I have a really high bar, only sharing the best of the best. 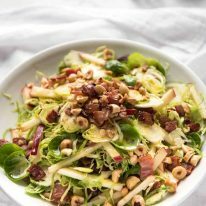 This brussels sprout salad is a recipe I'm sharing at the request of a brussels-sprout-hating friend after I served this at a lunch! 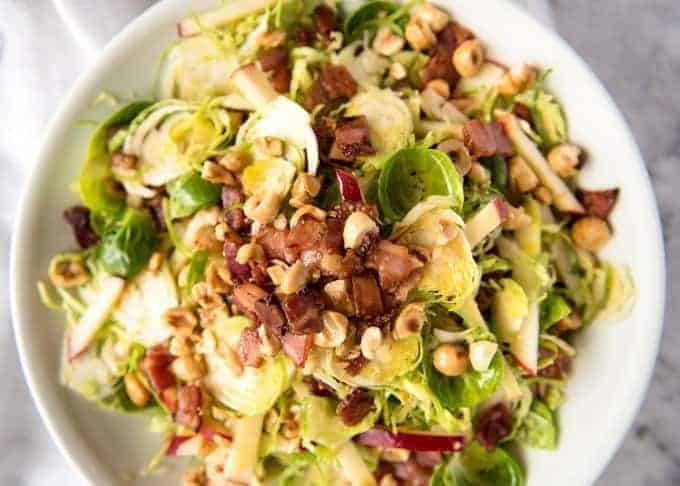 The key to what makes this so good is: shaving the brussels sprouts (makes the flavour so mild), the fresh juicy sweetness from the apple, pop of salty from the bacon and warm crunch from the hazelnuts. With all of that going on in a salad, you only need a very light simple dressing. Preheat oven to 180C/350F. Toast hazelnuts for 5 minutes or until golden brown. Cool then roughly chop. Set aside. Either place the bacon on the baking tray used for the hazelnuts and bake until golden, or cook in a skillet. Drain on paper towels. Cut apple into matchsticks, keeping the skin on. Toss in lemon juice. 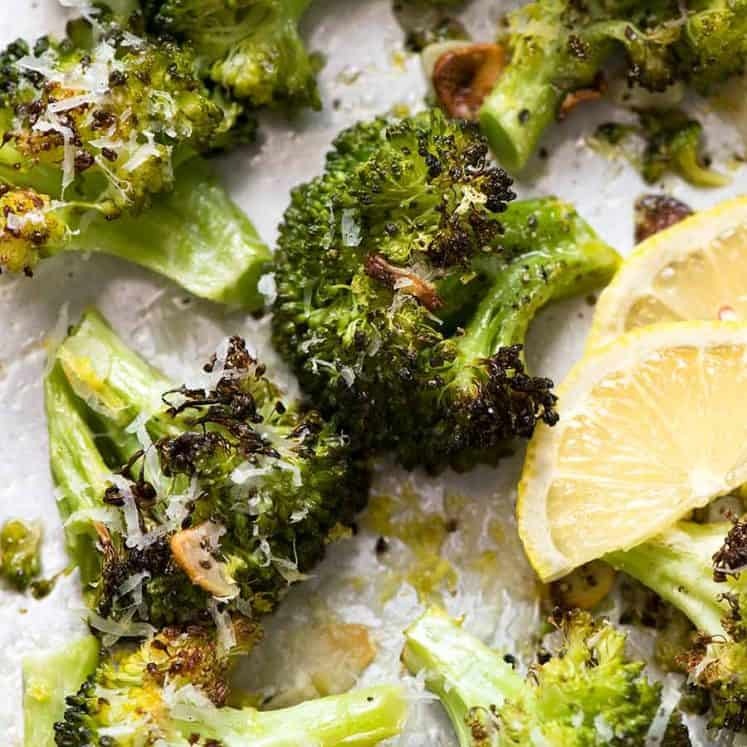 Shave brussels sprouts finely using a slicer or food processor. Place Dressing ingredients in a jar and shake well. Adjust salt and pepper to taste. Place Salad ingredients in a bowl, toss with Dressing. Set aside for 5 minutes before serving (to soften the brussels sprouts slightly). SERVE THIS WITH....This salad is quite light and refreshing, yet is loaded with flavour. So it pairs well with both lighter and heavy meals, both red and white meats and seafood as well. I served this with Self Saucing Oven Baked Barbecue Chicken which I also posted today. Woah! 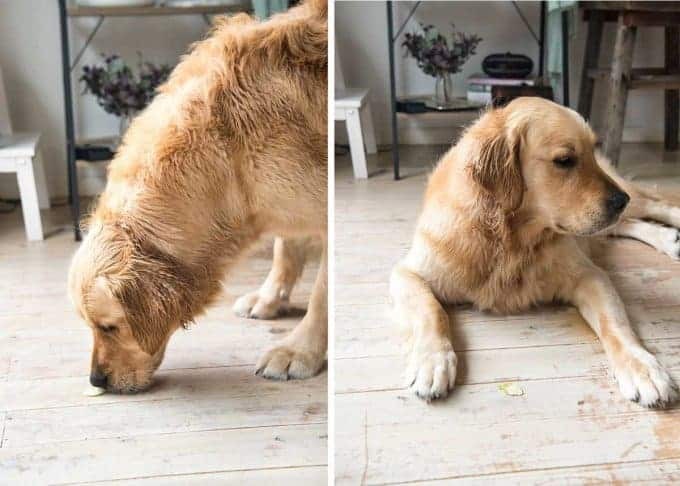 I finally found something he doesn’t want to EAT!!! Hi Sameera! All good, keep asking! How about Asian fried shallots? Can you get them? They are perfect – little pops of crispy saltiness! Hi Nagi I love your recipes. I shall be doing loads of them over the christmas break as having large family get together. We will be trying your Dry Turkey Brine (fingers crossed) plus the Ham and the Make ahead potatoes. Quick question in australia where can i buy shaved brussel sprouts??? Sounds wonderful! But not sure how to “shave” the Brussel sprouts? Does that mean grated? Sliced? Going to try this for Thanksgiving! Hi Mel! I use a mandolin. Otherwise, buy them pre shaved!!! I’ve just recently started liking Brussels sprouts! They’re so good for you too. Sheer genius Nagi! Never before have I fancied Brussel Sprouts, let alone raw, but this salad is magnificent. Love the crunch and the healthy aspects of your dish. Always looking for healthy dishes that are different and deliver on flavour. Thank you Ian!! You tried it??? I am a little obsessed with this salad at the moment – while brussels sprouts are still around!! Yes I tried it Nagi. Very nice indeed! Love Brussels sprouts raw or cooked, add bacon and everything’s good. Must try. I am honestly a little strangely obsessed with brussels sprouts!!! But then, I was never force fed boiled bland overcooked soggy ones. 🙂 What’s your favourite way? I think roasted (with bacon!!!) has to be my favourite. Lots of char, nice and salty! Oh this salad sounds heavenly. I absolutely love Brussel sprouts, but I’ve never had them raw. I can imagine how nice they would be with hazelnuts, thin apple sticks and bacon. I love brussels sprouts too!!! I actually can’t understand BS haters. 😉 But then, I’ve never experienced a soggy over boiled one!!! 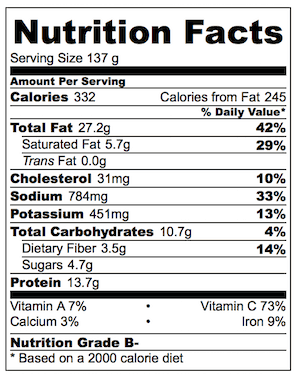 Just a note that step 5 and 6 both say to place salad ingredients into…. One should be dressing ingredients. I’m from Canada and have made many of your recipes!! They are absolutely delicious!! Thank-you for sharing with us!! Hope that you get feeling better soon!! This might convert him! Honestly, it converted my brussel sprout hating friend who requested this!! Hi Nagi! Just looking at the pictures makes me want this now! 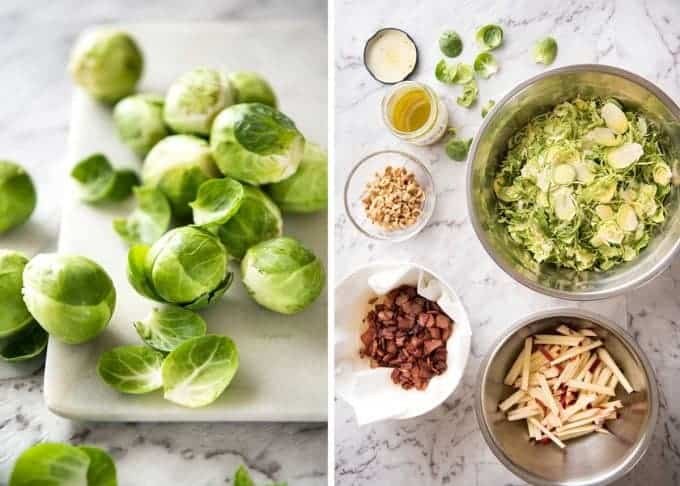 I happen to love Brussels sprouts and with the apple, nuts and bacon I love them even more! I do a cooked sweet and sour dish with them that (of course) has bacon in it. This would make a great side at Thanksgiving!